Fear of retaliation and the stigma associated with being a “troublemaker” or a “whistleblower” contributes to the underreporting of problems in health care. Any nurses or nurse practitioners placed in the difficult situation of reporting a problem that an employer has not addressed need guidance to decide whether to report, how to report, and what they should do to protect themselves and their families when they do report. They need to maximize the effectiveness of their report and minimize the negative repercussions. Many nurses will recognize this situation: A nurse wants to report a situation at work that he or she truly thinks is a problem but is afraid. Maybe the idea makes the potential whistleblower uncomfortable, or maybe it is creating a moral dilemma, with real stress and even physical symptoms or depression. Nurses study ethics and learn about the American Nurses Association (ANA) Code of Ethics for Nurses.1 They learn that they must be of good moral character and must act for the public benefit. But if your instincts tell you that doing the right thing can be dangerous, there is a reason why. Blowing the whistle on abuses in the nursing workplace can be hazardous to your employment, along with your mental health. This situation has impacted other caregivers, too. The more responsibility a caregiver has, the greater the exposure to serious events. Physicians, nurse practitioners (NPs), and nurses in a supervisory position are under pressure to respond to a wide variety of problems at work—everything from unprofessional or incompetent colleagues to kickbacks and fraudulent billing practices. Nurses have unique opportunities to witness both single incidents and patterns of improper behavior, disregard for procedures, or critically dangerous practices in direct patient care. Which of these nurses was recognized by the employer as a hero? None. Which kept their jobs after filing a complaint? As far as we know, the nurses who reported the psychiatrist were the only ones. Which of the complaints led to changes in health care, large or small? All of them. Without the warnings from these nurses, these practices would have continued to harm patients and our society. These nurses all submitted reports with their identities attached. When a surgeon reported a colleague for billing for procedures that he did not perform on pediatric patients that he actually took to surgery with full anesthesia for a minor and unnecessary procedure in order to bill, the whistleblowing practitioner reported it anonymously to the board of physicians. Unfortunately, the Medical Practice Act required a “signed” complaint, which board members had interpreted to mean “with a name and contact information.” But this report had so much detail that the board decided the complaint must have a basis in fact and decided to investigate. After all, it was “signed” by “Anonymous!” The outcome was that the bad surgeon was put out of business, and the good surgeon remains unknown, his or her reputation unscathed in the medical community. From him or her we can learn that, if you decide to report, how you report may be the next critical decision. An individual nurse (called a “relator”) who has a complaint involving abuse of federal funding (Medicare or Medicaid) can file a claim on behalf of the government, with or without the Department of Justice, under the False Claims Act, at 31 U.S.C. § 3729 et seq. This is called a qui tam case. The intent of the law was to encourage this reporting by awarding a percentage of the money that the government was defrauded to the successful whistleblowing relator. The whistleblower must be represented by an attorney to do this. Nurses should view whistleblowing as an extreme, last-ditch strategy to protect the public welfare, and they should also take a step back before leaping to this response. Consider not only the problem that you are addressing but also its priority among the other items on your life’s agenda. Will the ends justify the means? “Doing the right thing” in 1 case is sometimes not the best thing in the bigger picture. According to Lachman,2 Barry Adams, a nurse who was terminated after he reported problems related to low staffing in a New York hospital in1996, learned that “blowing the whistle can be a life-altering incident. Even though Mr. Adams lost his job, he must have felt a sense of achievement for speaking out about patient safety issues.” Do not assume that “a sense of achievement” will be the feeling at the end of the day. Two very recent cases involving nurses give some hope that reporting may one day be an expected role of the nurse, instead of having the negative connotation of whistleblowing. In Lark v. Montgomery Hospice,5 a nurse complained to her supervisor about the abusive handling of narcotics. The employer responded by firing the nurse, who then filed a complaint against the employer for wrongful discharge, alleging that the employer violated Maryland’s Health Care Worker Whistleblower Protection Act. Maryland’s highest court found that the employer’s failure to correct the procedures for narcotics was prohibited by law and that the intent of the law did not require the employee to file a complaint outside in addition to an internal complaint. The ANA and the American College of Nurse-Midwives were among those who filed arguments in support of the nurse. Our purpose here is to help nurses who are considering an act that would put them on the line to protect the safety of their patients and the integrity of health care by blowing the whistle about a problem at work. Table 1 outlines the steps that potential whistleblowing nurses need to take before they act. These nurses need guidance to decide whether to report, how to report, and what they should do to protect themselves and their families when they do report. They need to maximize the effectiveness of their report and minimize the negative repercussions. 1.Carefully assess the severity and type of problem. 2.Evaluate your priorities and your weaknesses. 4.Plan with an attorney before you act. 5.Identify your supports and be ready to change your life. You know who you are. This is for you. Whether to report depends on the type of problem, its seriousness, the evidence that you have about the problem, and the potential costs. These are the essential factors in assessing your concern. In some situations you may be afraid to make even a routine report. That is a sign of a bad system and a problem in itself. Does your employer not have or not follow appropriate procedures? Is your supervisor not accepting of reports? Is there an ethics hotline? Can you report anonymously? You should actively seek an employer who has a secure and anonymous reporting procedure and a work environment that encourages these reports. Is your “parachute” ready? Get your letters of recommendation together beforehand. How serious is the problem? You should know your employer’s procedures for reporting problems or at least where to find them. In most cases you have met the advocacy duty with the routine report and have no duty to follow-up or to go outside the chain of authority. This whistleblowing “report” means that you have to go outside the chain of authority in the workplace to address a problem. Remember that almost everything in health care is serious, and no one is perfect. Is this a regular occurrence or a 1-time accident? Does it present a specific or immediate threat to patient safety, or is it just a situation that is less than ideal? Do others see the situation as a critical problem? You can do some preliminary investigation of this yourself. For example, in some states you can call the practice specialist at the board of nursing and ask about your scenario—hypothetically, of course. Contact information for all state boards is available through the National Council of State Boards of Nursing (www.ncsbn.org). Is your nursing license in legal jeopardy if you do not report? Answering these questions will help you decide whether this problem rises to a level that may require you to follow up on it. That level should be at the top of the chart to merit your becoming a whistleblower. What type of problem is this? Was a law violated? Is it a life-threatening problem? Does it involve gross abuse of authority for financial gain? Is it the type of problem that you have special access to and information about that others do not have? On the other hand, ask yourself whether there is there any real or even apparent conflict on your part. For example, would this report be directed against someone who is competing with you for a better position or who once reported you? Is this something recent, or did it happen a long time ago? Some laws have a time limit on when you can take action. A problem that you would decide to report should clearly violate a law or standard of care if proven. You have the kind of problem that is appropriate for follow up if this problem is critical, involving illegal acts or an immediate and serious risk to patient safety, and it is not stopped by a routine report; if you had access to the situation and are a direct witness; or if you have maintained good records with corroborating documentation or other witnesses. You have identified an urgent need, your goal, and the benefits to patients or to the public health and safety. Now you have to assess your potential costs. What are the potential costs of whistleblowing? This question goes back to your initial fear or hesitancy. You were aware that there are risks and potential negative consequences, and now you must identify and weigh them. To do this you may need to talk to other people whom you can trust to maintain confidentiality, such as a spouse, mentor (not at the workplace), counselor, or attorney. What will you do if your employer retaliates? What could you reasonably expect as the worst that could happen to you or to your family if you make this report? This process provides you with several advantages. It enables you to validate your determinations about the seriousness and type of problem, and your role in it, with outside, objective observers. It helps you identify some of your resources. Finally, is there anything in your past that might make your testimony less than perfectly credible? Did you ever underpay your taxes? Were you arrested for partying on senior weekend with friends who had alcohol or marijuana in their possession? Are you ready to experience scrutiny, cross-examination, and retaliation for this report? If you decide that you should report, assessing the potential costs is a critical step in making your plan to blow the whistle. Now that you have assessed the problem, the next step is to plan. You must anticipate that your employer may not see you as a hero but more like an attacking enemy. This could become a war. You need to identify your sources of support and your helpers, outline a strategy that will result in effective reporting to the right source and that will, to the extent possible, minimize the negative consequences for yourself professionally and personally. Your plan should be designed to protect your physical, psychological, and financial well-being, as well as your family. Each plan will be unique to the situation. This is not the type of planning that you can do alone. You must consult with an attorney who has experience in whistleblowing and nursing or health care laws. Proper procedure is a critical requirement in whistleblowing, so the sooner you do this, the better. Let your attorney develop and pursue the best legal plan for you. There are multiple laws at both the state and federal level that regulate your profession, your employer (whether private or public), financial issues, criminal and civil issues (such as defamation), and even retaliation against whistleblowers. There are also cases similar to yours that have gone before you and that will provide guidance. When you meet with the attorney, be prepared to answer many questions, some of which we raised above. What are your education, experience, and licensure? Who are your personal and professional references? What is your job description? Do you have copies of your performance evaluations from personnel? What is your present situation? Who is (and was) your employer? Describe the problem and how you can prove your observations were accurate. Where is the evidence that shows what should have happened? What are the documents? Who else knows about this? Who are the witnesses? Were you a witness? Did you participate? Who are the others involved? What are their backgrounds? What are their positions? What is your relationship to each of these people? What are your employer’s relevant policies and procedures? What procedural steps have you already taken to report this situation, if any? What harm resulted from this problem? How can we prove it? Who are the victims? If financial matters are involved, where are the documents and the accounts? Do you have dates, names, and numbers? If not, where are they? What are your goals? What is motivating you to make this report? A counselor or support group is also critical. You must have a personal plan and resources for getting through whatever ordeal may lie ahead. Table 2 lists some online resources that may help you get started. Whistleblowing can result in a huge financial windfall (1 of these authors has 2 colleagues who moved to Florida and have their own planes after successfully pursing a case involving fraudulent billing), but it is much more likely to result in tremendous stress, including personal rejection, social ostracism, and job loss. No one is ready to face that kind of adversity alone. What happened to the nurses in our scenarios provides compelling evidence for why it’s so important for attorneys to have the whistleblower psychologically evaluated by medical professionals and referred to counselors and support groups. This is best done before the whistleblower is overwhelmed with retaliation and the stress of the case. The evaluation also provides a baseline marker for an expert who has to determine the damage caused by the retaliation. Such findings may eventually be presented to a jury or judge. As the whistleblower moves from job loss to choosing another field, a psychotherapist and a performance coach can assist with career planning. As an expert witness in these cases for many years, Dr. Soeken, 1 of these authors, observed that the initial evaluation of the biopsychosocial impact on the whistleblower is frequently the key to a successful outcome of the case. His long career as an expert witness in these matters has also shown that obtaining such evaluations and support often allows an attorney to gather critically important evidence about damages arising from employer retaliation, and this kind of evidence can be decisive in the awards eventually handed down by judges and juries in false claims and other kinds of whistleblower cases. An accurate physical and mental evaluation of the whistleblower will defend against the risk of losing your qui tam relator to disabling ailments later. By establishing a “psychological baseline” at the start of the process and then arranging for psychological counseling where appropriate, the attorney can also continue to monitor the physical and psychological well-being of this key witness. Most attorneys, in my experience, are keenly interested in meeting their ethical obligations to clients. Is there a more urgent obligation than doing your best to make sure that clients don’t suffer needless injuries in cases where you are charged with defending them against a powerful adversary’s determination to shut down their legal actions by whatever means necessary? Arranging for early counseling and support is a very good way to defend your qui tam client to the max. Given all of these bottom-line benefits, it simply makes good business sense for qui tam (and other whistleblower) attorneys to arrange for evaluation and support for relators at the start of false claims actions. And those attorneys who do so will also gain another key advantage in the effort to recover significant damages for their clients: the knowledge that their qui tamrelator will be assisted throughout the litigation by a fully qualified, potential expert witness who will be prepared to testify at any time on the subject of injuries caused by illegal retaliation against the courageous truth-teller who brought the action in the first place. Many whistleblowers need support in the form of ongoing intervention to help them survive the extreme stress of their actions. It is therefore crucial that, after they receive an extensive evaluation, they should also receive support tailored to their personal needs. A performance coach is also advisable to help the whistleblower begin a new paradigm shift in career. In addition, there often needs to be a major change in thought patterns—a radical change in how these individuals think about their former careers and perhaps a radical change in personal beliefs to improve and enhance the way in which the truth-teller has in the past thought about self-identity and self-worth. Hopefully, the whistleblower can learn to see himself or herself as an honest person but in a way that is no longer needlessly destructive to the individual’s nursing career. It’s also helpful, in this context, to remember that whistleblowers have often described their stressful experience by saying that they would do it all again—but perhaps in a different manner. A potentially helpful resource is the National Whistleblowers Center, a nonprofit, tax-exempt, educational and advocacy organization dedicated to helping whistleblowers survive the act of uncovering waste, fraud, and abuse. Since 1988, this organization has encouraged and supported whistleblowing where it can result in improving government and corporate accountability, along with environmental protection and nuclear safety. The Whistleblower Support Center and Archive is another nonprofit organization that was founded to provide support to whistleblowers. The center’s Web site provides helpful information, including the 10 steps for effective whistleblowing shown in Table 3. 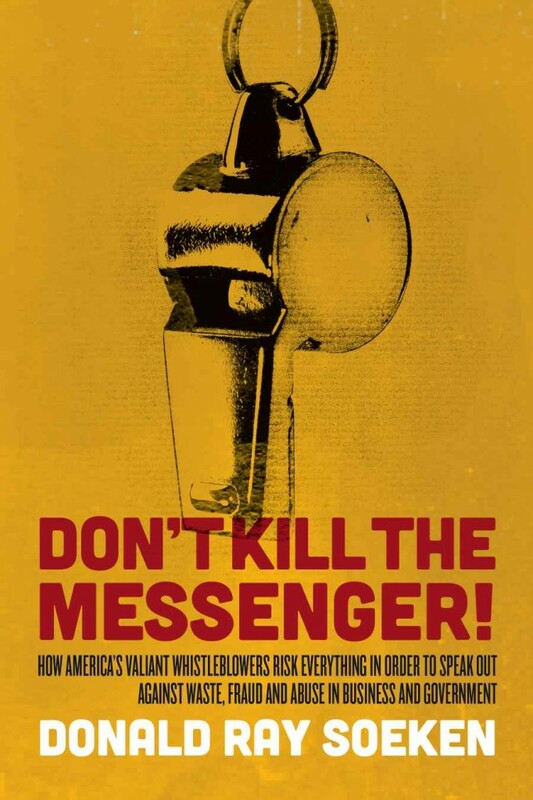 A major focus of the effort here to support whistleblowers is the International Whistleblower Archive, an extensive online search engine that provides thousands of articles related to whistleblowing. Attorneys, journalists, whistleblowers, and others can tag almost any aspect of the process and then gain access to a vast array of online resources. Former whistleblowers are available to provide peer-support to future whistleblowers. The program also includes a performance coach who can assist whistleblowers in assessing options related to changes in career. 1.Are you ready to put your career on the line? Talk to your family and friends so that they can be with you when the times get tough. 2.Decide which of the alternatives you can use to solve the problem. For example, will your superior retaliate against you? If so, don’t tell that person. Is there a confidential way to pass along the information to the proper authorities so that an investigative group can take some action? The ethical functioning of the government or institution is the responsibility of all persons in the organization. If you are the only person with the information, you will become the target of investigation. 3.Keep a log or diary of all facts or insights about the case. If legal testimony is required at some point, this log may be helpful in constructing a chronology of events. Identify your supporting documents before you draw attention to yourself. Once you blow the whistle, records may disappear and not be accessible to you. 4.Identify your support groups such as elected officials, nonprofit organizations, journalists, church or social clubs, professional organizations, and others. If you do not have a group behind you, whistleblowing will be a lonely, uphill battle. Often these groups can act as third parties to speak to the press and others. 5.Before you go public with the information, attempt to carefully and informally talk with selected and trusted peers. Ask what they think about the problem. Remember that you will need to be tough-minded to stick it out. Your witnesses and friends may be pressured to come forward with information against you, so the support of peers in addition to family and friends is extremely important. 6.Check with groups who work with whistleblowers for advice and support and to develop an action strategy for your case. Integrity International, the Government Accountability Project, and the Project on Government Procurement might be helpful. Whistleblower cases tend to have similar legal strategies, and building on the experience of others is helpful. Remember, though, that these groups usually have a waiting list of clients. 7.If you cannot think of a way to anonymously leak your information, talk with your attorney to determine whether your legal position is sound. You may also want to know the fees and upfront costs in case you need to file a lawsuit. This is extremely important! You may not have enough savings to cover legal costs. 8.Be on your best behavior. Once you blow the whistle, your supervisor and colleagues will be observing your behavior, so do not make your situation worse by breaking some obvious rule, for example, by arriving late to work or leaving early. Be aware that support staff may be asked to observe you or security police may be used to investigate you. 9.Focus your disclosure on the facts rather than on an individual in the organization. Avoid pointing the finger at anyone. Rather, let the disclosure itself leave a trail to the guilty party or parties. 10.Leak the information. Despite the recent controversy about leaks in Congress, all levels of government leak information. Since it is important to protect your identity, I recommend giving the information to a third party who will then leak the information. The task is to get the necessary information to the proper investigative group so that they can do their work. Attempt to keep out of the path of the inquiry. Don’t be afraid to retreat. Taxpayers Against Fraud8 is a nonprofit organization with a Web site that describes recent claims under the False Claims Act and refers potential whistleblowers to attorneys who specialize in representing that population. Another outstanding resource for whistleblowers is the Government Accountable Project (GAP), which currently ranks as the major legislative and legal support organization at work. GAP provides information and services to whistleblowers, including a packet on protections, information on recent cases by category (including public health), and a blog. GAP also heads up the “Make It Safe Coalition” of over 50 private and government organizations. American Nurses Association . Code for ethics for nurses with interpretative statements . Silver Spring, MD: American Nurses Publishing; 2001;http://www.nursingworld.org/MainMenuCategories/ThePracticeofProfessionalNursing/EthicsStandards/CodeofEthics.aspxAccessed May 31, 2011. Lachman VD . Whistleblowers: Troublemakers or virtuous nurses? Medsurg Nurs .nursingworld.org/DocumentVault/Ethics/Whistleblowers-.aspx 2008; Accessed August 11, 2011. Texas Nurses Association . Patient advocacy protections: Whistleblower laws .http://www.texasnurses.org/displaycommon.cfm?an=1&subarticlenbr=162 Accessed May 31, 2011. Council on Licensure, Enforcement, and Regulation. National Certified Investigator/Inspector Training .http://www.clearhq.org/Default.aspx?pageId=463249 Accessed May 31, 2011. Lark v. Montgomery Hospice, 994 A.2d 968 (2010), 414 Md. 215. Taxpayers Against Fraud . The TAF Education Fund (September 2005) .http://www.taf.org/publications/PDF/TAF_QR_v39.pdf Accessed May 31, 2011. In compliance with national ethical guidelines, the authors report no relationships with business or industry that would pose a conflict of interest. © 2011 American College of Nurse Practitioners. Published by Elsevier Inc. All rights reserved.